Bhopal: Wang Qi, a Chinese prisoner of war who settled in Madhya Pradesh’s Balaghat district after his release from jail and raised a family here after marrying an Indian, is all set to fly to his native country after five decades. Wang, now 77, was caught for entering the Indian territory shortly after the Sino-India War of 1962. He was later released from jail. “Wang with his wife Sushila, and their son Vishnu and two other family members will be flying to China,” Balaghat Collector Bharat Yadav said. He said Wang and his four family members got visa today and they might fly to China tomorrow. This has happened due to the help they received from the Ministry of Home and External Affairs. Official sources in Beijing said Wang and his family members are expected to arrive here tomorrow. After their arrival, they would travel to his native place in Shaanxi Province to meet Wang’s relatives, they said. The development has come within a week after a delegation from the Chinese Embassy met Wang who had been wanting to visit his country. “Three officials from Chinese Embassy in India met my father and talked to him for more than one hour. They assured him all possible help to visit China,” his son Vishnu (35) had said over phone from Balaghat on February 4. 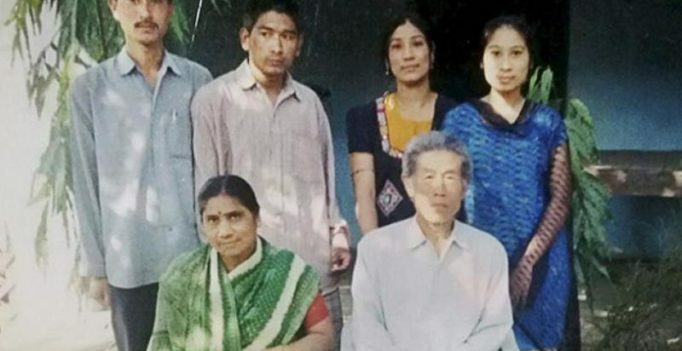 Wang, who lives with his wife and three children in Tirodi area of Balaghat district, has not been able to visit China for the last five decades for want to permission from Indian government, according to the family. “My father joined the Chinese Army in 1960 and he entered India through the eastern frontier after losing his way in the darkness one night,” son Vishnu said. He landed in Assam where an Indian Red Cross team handed him over to the Indian Army on January 1, 1963. “My father spent six years in prisons in Assam, Ajmer, Delhi before the Punjab and Haryana High Court ordered his release in March 1969,” Vishnu said. “The Indian government had promised to the court that it will rehabilitate my father. He was taken to Delhi, Bhopal, Jabalpur and then finally handed over to Balaghat police,” said his son. Wang started working as a watchman with a mill and soon his colleagues named him Raj Bahadur, apparently due to his Nepali features, Vishnu said. But little did he know that the enemy nation against whom he had waged a war would become his home, where he would raise a family. Wang married Sushila in 1975 but his desire to live a comfortable life was short-lived. “Soon after my father married my mother, the Indian government stopped his monthly pension of Rs 100,” Vishnu, who works with a small business unit as an accountant said. “My father faced a lot of hardships, wanting to go to China. He tried very hard and even entered into correspondence with the then Prime Ministers but in vain,” he said. According to Vishnu, Wang also moved a plea in Madhya Pradesh High Court in 2009 for going to China but couldn’t succeed. “His life has been difficult as he couldn’t get Indian citizenship because of his Chinese origin. Hence, he couldn’t buy land or avail other facilities,” he said. Home sick Wang’s mother died in 2006 but he could not be with his dear ones in the time of grief, Vishnu added. Three years later he met his nephew Yun Chun, who had come to India as a tourist in New Delhi and narrated his ordeal to him. After returning home, Chun got in touch with Chinese politicians and authorities to bring his uncle home. Finally, he met then Chinese Foreign Minister who helped Wang to get a Chinese passport in March 2013. ‘Beauty and the Beast’ trailer breaks record, becomes most viewed of the year!